Mom was cleaning closets and I was helping. When she feels the urge to purge (and clean and straighten) she usually takes a nap and waits until the urge passes. But, for some reason she was MOTIVATED. Did I mention I was helping? Readers with very good eyes will notice that there is a bottle of glass cleaner that appears to be coming out of my tail area. It is not. It is on the steps, behind me waiting patiently with the other cleaning things. First we remove, and sort. Then we clean. Then we put back. And in the middle we play. That’s what we were doing in the picture. If I remember correctly, my sister (the girl person) found the gloves and put them on to see if Mom would notice. I am so happy when people notice me. I think I look like the very noble creature, the seal. 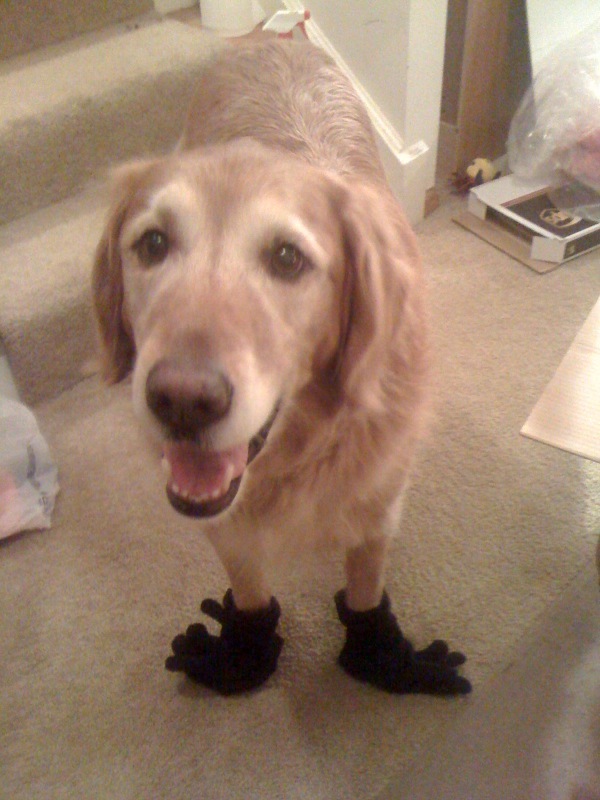 The black flippers are very atractive on me. I approve of them. I approve of most things. Therefore, in this picture, you may think of me as the Seal of Approval. Sadly we had to go back to cleaning. No gloves were harmed in the making of this blog. Get my Mom’s blog delivered to you via email, or read it online. (By the way, she Twitters too. Entry filed under: Dog Stuff, From Under The Desk. An Unexpected Quilt Connection	Is This Up To Code?! Madison , you are just terrific. If I tried half the things with my Andy that your mom does with you he would be very upset with me. Madison…We love you. That would be me and my two goldens, Ben and Quinn. Have a great day! Oh Madison, you are just the cutest and especially when you wear gloves. Keep on blogging. I enjoy hearing about you and your family. You’re a better golden dog than I am. I’d have those gloves ripped off in no time–unless I got lots of attention while I was wearing them. Madison: You are one of the most patient “people” I have ever “met”. Do you have a much fun as your family seems to, always dressing you for events, or just to let us know how great a person you are. I,too, have been hit by the cleaning bug this week. I have moved half of the stuff out of my sewing room to sort and remove. Thus far, there has been some sorting, very little removing, and lots of, “wow–I forgot I had that” comments made. My husband was hiking the Grand Canyon and I thought I’d be able to complete this project before he returned. Well, he’s back and I’m not finished sorting-removing-reorganizing. Oh, well. Here’s a cyber pat to you and your Mother–Keep up the good work! Madison, I approve of you: your posts are priceless! As well, I am sure, are your cleaning, sorting and playing abilities. Lucky Ami (and lucky you)! If you just HAVE to clean a closet, why not make it fun? I like the way you think! Thank you, Madison, for taking the time to post things that are so endlessly amusing to us two-legged creatures! You’re the coolest dog ever! Madison, you definitely have MY seal of approval. Madison – you are the best! Best wishes for the new year, Madison. Mom can’t seem to find many blogs written by us dogs and we always enjoy yours! Oh Madison T. Dog–you do light up my life. Your “flippers” are darling and so are you. Thank your mommy for sharing you with us. Very attractive ~ those flipper feet! Bless you, Madison. You are soooo patient! soooooo cute. i love madison and (ami too)! Aw, Madison, your blogs make my day. And you certainly do deserve to be the Seal of Approval ! glad to know that yur Mom cleans the way I do, work a little, nap a little, work a bit more, check out the newest magazine etc…somedays something even gets finished! Sounds like you & Mom even had a fun day cleaning. Maybe I should borrow my sister’s child, “Zippy”. She likes to check out the insides of shoes, purses & boxes that smell like snacks. You definitely have my seal of approval, Madison! My standard poodle would give me such a look if I tried that on her. She tries very hard to be a scruffy sheep-girl for her Daddy. Dear Madison T. Seal – ah, er – Dog! Arf arf arf (that’s seal talk for LOL!) Do keep up the good Approval work for Ami. Hmmm, maybe you could go as a seal for Halloween this year! Madison T., YOU are sublime!!! I LOVE your flipper paws and Seal of Approval! ; ) Or-T, ort, oRt…you get the idea. Madison, You are my main man!!! a friend sent me your blog and I thought it was really cute, just like you! Would you like to visit with Bella? She’s a very special cockapoo girl and has a great personality. Almost everyone likes her friendly demeanor. Keep helping you’re mom and always have fun. Our Best! Hi Madison, I love the way you always make me smile. That is a really good thing. Thank you. Come and visit more often.